Summer means vacations and beach time, and it allows us to finally shed our extra winter layers. But getting back in shape is often easier said than done. 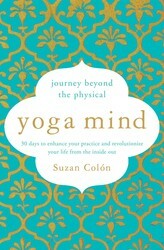 In an original essay, YOGA MIND: JOURNEY BEYOND THE PHYSICAL author Suzan Colón reveals the spiritual tools that can help you get fit and stay that way. I’ve been studying yoga for 25 years and teaching since 2002, so you could say that yoga is my favorite way to get and stay fit. But it’s not only the physical practice of yoga, Asana, I’m talking about. Yoga is actually a spiritual, philosophical, and ethical way of living. It was designed to show us how to live well and do good when we’re off the mat, not just when we’re on it. These spiritual tools can be applied to any area of our lives—work, relationships, life events, health, even body image and fitness. Starting or maintaining a fitness program is a good thing, as long as you choose the type of exercise that’s right for you. That’s where the spiritual tools of yoga come in. These practices (I think of them as being like Jedi mind tricks) can help you do that, adapt as your body changes, and keep going. Sankalpa, or intention: Setting a Sankalpa is different from a resolution in that it’s not punitive or negative. Most resolutions are made with the idea that you will be better when you are other—thinner, fitter, vegan, etc. A Sankalpa assumes that the person you truly are is holy, and that you are setting an intention to bring more good into the world. A Sankalpa is usually set for the benefit of others, as in, “May I get fit and be healthy for my family, so I can enjoy life with them.” When an intention is set from a feeling of love, rather than a feeling of being somehow less than, you’re more likely to see it through. Santosha, or contentment: Discontentment with our bodies and the way we feel may motivate positive change, but sometimes people choose ways of getting fit and losing weight that are just as unhealthy in a different way. Radical diets and workouts that cause pain punish body and mind. Instead, honor your body, and give yourself peace of mind, by finding a form of movement that feels good to you. Something you like doing, even if it doesn’t have the dubious cache of being a grit-your-teeth, sweat-bullets kind of exercise. It’s only logical to think that if you like doing something, you’ll do it more often. And you’ll (wait for it) actually enjoy it. Dharana, or focus: At the gym, you’ve probably seen people watching TV screens on the walls or embedded in the workout machines as they run or cycle. Some also listen to music while they watch. (Maybe you’re one of them!) At some point, the idea that getting fit is boring, an activity that needs distractions, was installed along with all those screens. But taking your focus away from your workout could be cheating you of valuable results. In a study done by the Cleveland Clinic Foundation in Ohio, one test group was sent to a gym to work out; another group was instructed to visualize the same workout. The group doing the actual physical workouts had muscle increase of about 30 percent. Surprisingly, the group merely visualizing the workout in their minds also gained muscle—13.5 percent. That’s nearly half the amount gained by the gym group. The power of your mind on your body can’t be denied. 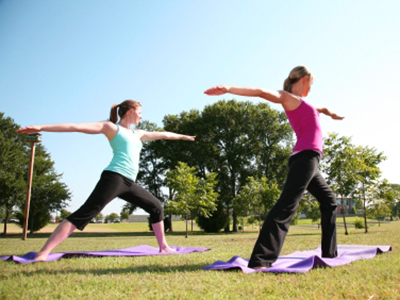 If you want to get the most out of your workout, use Dharana. Instead of getting lost in a screen, focus on the sensations of what you’re doing; the quality of the air around you; the various muscles your breathing uses; and do a body scan from your feet to your head. The bonus is that you turn your workout into a form of meditation. Sutra 1.14: The Yoga Sutras of Patanjali are a string of wisdom teachings that form the basis of yoga’s philosophy and ethics. Sutra 1.14 reads, “Practice becomes firmly grounded when well attended to for a long time, without break, and in all earnestness.” In other words, don’t give up. Sometimes results take a long time to see and feel, and are so incremental, that we feel it’s not worth continuing. Strangely, the reverse is also true; even when we get the results we want, finishing a half marathon or reaching a healthy weight, we may also give up and stop doing the things we did to attain that success. After all, the goal’s been reached. But soon, we’re back where we started, if not worse off. The solution? Don’t set a finish line, whether it’s in a race, or a day, like a high school reunion, or a number on a scale. Think in terms of starting a new practice of habits that make you look and feel your best. This will work for you at any age since it allows you to recalibrate what you do to feel good about yourself. We can’t define ourselves by numbers or what we hope others will think of us. We define ourselves by the actions we take to become our best selves. In yoga—the path, not just the exercise—we’re taught to honor our true selves in this present moment. When you do that, you’ll attain the physical fitness that’s right for you, and something even more important: spiritual fitness. Plus, Suzan shares 5 ways mindfulness can be your new meditation.